The 'Cyclonic Monk of India', as the press dubbed him in 1893, stormed Chicago once again, except this time appearing as a laser figure through the highly acclaimed laser documentary on his life-story. 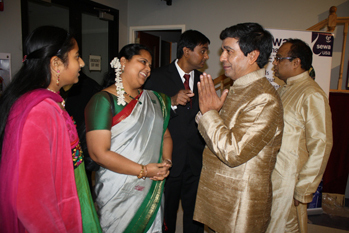 "Swamiji" swiftly won the hearts of Chicagoans and Detroiters on two successive days. and run by SEWA volunteers that ranged from young children to senior citizens. This fund-raising event was celebrated like never before. The preparation was going on for months and on October 26, 2013, it climaxed with the 1.5 hour laser documentary on Swami Vivekananda by Manick Sorcar. 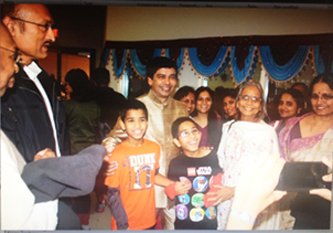 The venue was the Community Center Auditorium of the Jain Temple at Bartlett, a suburb of Chicago, Illinois. 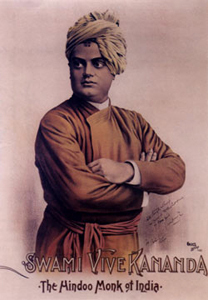 Portraits of Swami Vivekananda, books, posters, SEWA Tee-shirts etc. 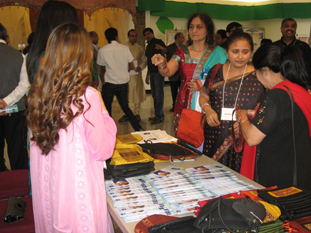 all were on display at the lobby, in addition to a full course Indian dinner after the show. 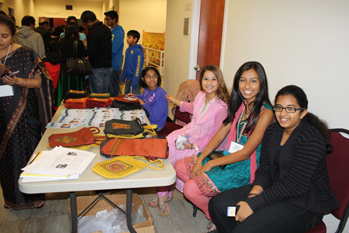 All were a part of the highly successful annual fund raising program for the SEWA International USA, Chicago Chapter. The volunteers, starting from young children to senior citizens - all took active part in this successful and cheerful event that ran for several hours. 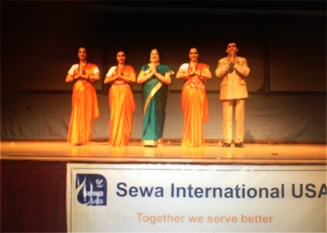 The program started at 4:30 pm with 'Vande Mataram' invocation song sung by Ms. Minu Pasupathi, as a part of SEWA's introductory presentation which included speeches, video shows, giving awards, and to recognize sponsors. At 5:00 pm the wireless microphone was handed to Manick Sorcar to start the main program. 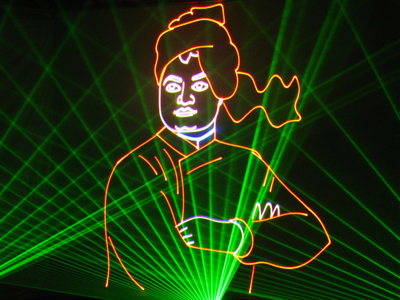 Following the "Prayer Dance", and "Vandana" (an overture-ballet to the composition of Swami Vivekananda) - both in combination with laser graphics and spectacles, the laser documentary started at 5:30 pm. The innovative one-hour documentary, which is recorded as the longest laser documentary on any human being, started with black and white original images from the pages of an old picture book which showed famous scenes from the 1893 Columbian Exposition in Chicago before arriving at the Columbus Hall of the Art Institute. There, Swami Vivekananda gives his famous speech at the Parliament of Religions, whose opening line produced a standing ovation that lasted over two minutes. As his message of religious tolerance is carried out and white doves are seen flying from the roof of the Art Institute, the pages flip back to the front page as the black and white images come to life in colorful laser graphics and three-dimensional visual effects to narrate the story from the beginning – all through the medium of the state-of-the-art lighting technology. 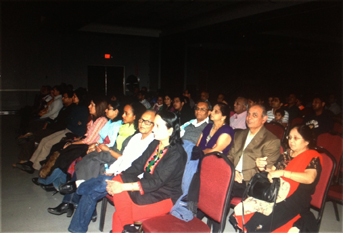 The complete laser documenary on Swamiji was witnessed by a spellbound audience in pin-drop silence. 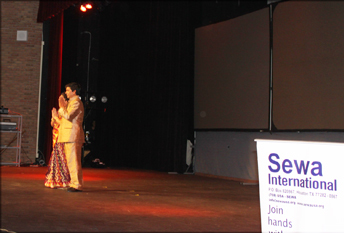 At the end of the last scene from the show, when Manick Sorcar Production group came to the stage to take a bow, they were greeted with cheering applause from the jubilant audience, and were felicitated by SEWA. After the show of Chicago, Manick Sorcar Productions team and their equipment were in their traveling coach for a five hour non-stop ride to Detroit, Michigan, the home of automible giants General Motors, Ford and Chrysler. They reached the hotel at 3:00 am on October 27, Sunday, to get ready for the next show at 4pm on the same day. 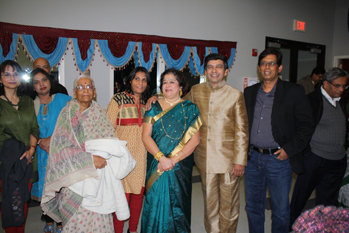 This was the first fundraising ceremony for SEWA International USA Detroit Chapter, which proved to be a resounding success. 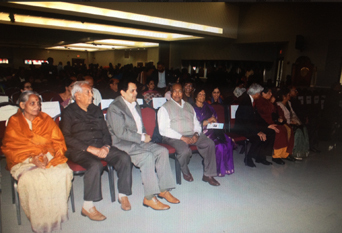 Peforming at Detroit, Michigan was of great significance to the Manick Sorcar Production group as this was one of the five major cities in the Eastern and Central USA, where Swami Vivekananda started the lecture tour soon after the Parliament of Religions. He came to Detroit twice, in 1894 and 1896, speaking to standing-room-only audiences in churches, a synagogue, and downtown hotels. took place on October 27, 2013. SEWA presentation started at 4 pm, with the invocation song by Aneesha Mantripagda and Sri Chandana Anumolu, and lighting the lamp by Arjun Soorya, President of VHP. 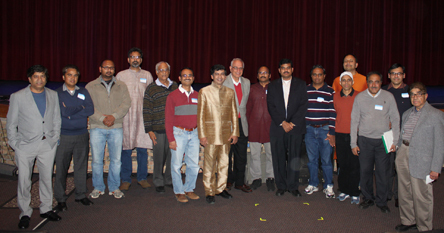 Welcome address was by Chandru Acharya, followed by projection of SEWA video and international report by Sree Sreenath, and Detroit chapter report by Uday Gopinath. After this, Manick Sorcar took over the stage to start the long-awaited show. At 4:30 pm the show started with a short speech by Manick Sorcar who thanked SEWA for giving him the opportunity to perform at Detroit and many other cities across USA to spread the messages of Swami Vivekananda on religious harmony and brotherly love. Manick pointed out soul's satisfaction lies in service and serving human is devine, the same motto as that of SEWA ,which ties perfectly with the moral of the evening's program as will be evident with the life story of Swamiji. The magic of "Swamiji" laser documentary prevailed here, too. 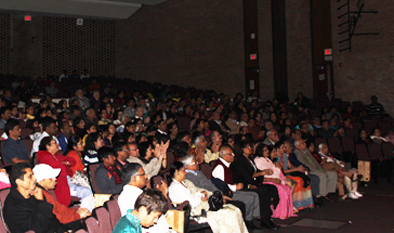 Following the same pattern of reactions as in previous venues, the unique 1.5 hour show in Detroit, Michigan was experienced in pin-drop silence by the spellbound audience for the entire duration. 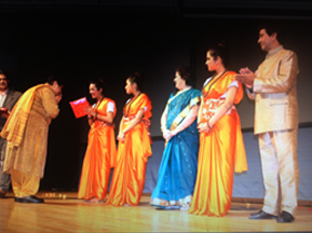 After the show was over, the Sorcars were felicitated with gifts by SEWA, and the program came to a formal end with Vote of Thanks by Harish.